The retiree cost-of-living adjustment (COLA) is based on the average annual change in the U.S. Department of Labor, Bureau of Labor Statistics Consumer Price Index (CPI) for All Urban Consumers for the San Francisco-Oakland-Hayward area. According to the County Employees Retirement Law of 1937, the SCERS Board must determine the appropriate COLA for SCERS retirement benefits and implement that COLA on April 1st each year. In making the COLA calculation, the average annual CPI for the calendar year just ended is compared with the average annual CPI for the preceding calendar year and rounded to the nearest one-half percent. 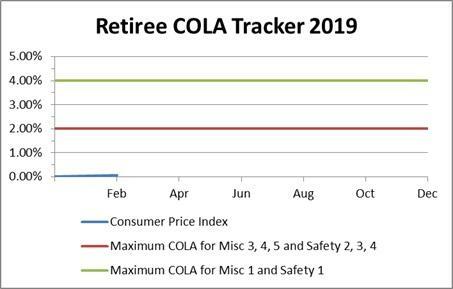 While the exact COLA amount will not be determined until the first quarter of the next calendar year, we have provided a COLA tracker to show retirees how the COLA is trending as of the most recent CPI data, which is released bimonthly. These values are estimates and subject to change with the next set of CPI data. Please note, the actual COLA that a retiree receives is dependent upon the individual’s tier and date of retirement, and includes consideration of whether the individual has any accumulated carry-over in his/her “COLA Bank.” The maximum annual COLA for Miscellaneous Tier 3, 4, and 5, as well as Safety Tier 2, 3, and 4 is 2%. The maximum annual COLA for Miscellaneous Tier 1 and Safety Tier 1 is 4%. Miscellaneous Tier 2 does not receive a COLA. A retiree accumulates a balance in his/her COLA Bank if the actual cost-of-living increase for a year is greater than the maximum annual COLA authorized for the retiree’s tier. If the actual cost-of-living increase for the year was more than the maximum allowed, the retiree would accumulate the excess into his/her COLA Bank. The balance in the COLA Bank would then be applied the next time the actual cost-of-living increase for the year was less than the annual maximum annual COLA.